The Lisburn Castlereagh economy is to receive a welcome jobs boost with an investment of £1.8 million from ASSA ABLOY Security Doors, a UK division of ASSA ABLOY, the global leader in door opening solutions. 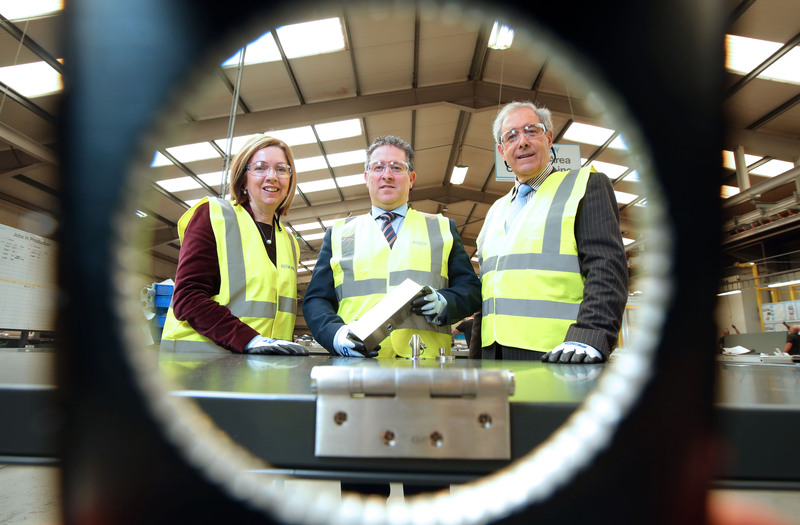 The injection of £1.8 million will create 27 new jobs bringing the workforce total to 132 and is part of the company’s ambitious growth plans to create a Centre of Excellence for door production at the Lisburn plant. Speaking about the expansion, Managing Director at ASSA ABLOY Security Doors, Brian Sofley, said: “We are extremely proud of our facilities here in Lisburn and our management team are committed to developing our business in the Lisburn Castlereagh area. There is a real appetite from our group to invest in our growth plans for the future and to create a Centre of Excellence for door production in UK and the current period of growth places us one step closer to this. As the business expands we are keen to offer skilled apprenticeships and to work with the Council and local college, SERC, to ensure our plans will benefit the local economy. “We are part of the ASSA ABLOY group employing 45,000 worldwide, currently ranked in the top 100 most innovative companies by Forbes, and our plant in Lisburn is an integral part of this success. With an impressive portfolio of projects including The Shard, the Olympic Stadium, Heathrow Airport and multiple sites across London Underground, we are raising the profile of the Lisburn Castlereagh area across the world and also providing employment and investment for the local economy,” he concluded. Based in Ferguson Drive Lisburn, ASSA ABLOY Security Doors designs, manufactures and installs bespoke high performance steel doors and windows for commercial and custodial markets. They offer the UK’s leading range of proven security doors – Powershield Steel Doors and Safeguard Timber Doors and all the precision made doors are supplied with factory-fitted hardware and installed by skilled teams of directly employed site personnel, who are all experienced in today’s construction procedures. ASSA ABLOY is the global leader in door opening solutions, offering some of the best known and most trusted names in security and architectural hardware, including Abloy, Adams Rite, ASSA, Corbin, NEMEF, Paddock, UNION and Yale.